Two years ago I had a dream, a burning desire, a passion to make something that I had long imagined calling START HARP. I wanted to make harp accessible for those living in remote areas, for people with hectic schedules, for those on a budget not able to go for an expensive harp, for people who (like me) are not great in one-to-one lesson situations. I wanted to make learning the harp more sociable, create a group of supportive learners all working together with similar goals, to laugh together, commiserate over the tricky parts of learning and performing, fill the empty void of weeks of solo practicing and try to minimise the frustration and isolation that can sometimes be felt when learning on your own. I wanted to make practicing as informative and joyful as possible, to create play-along practice videos so people would know exactly what was important to work on week by week, where students could play duets with me all week long, to make that lovely feeling of being part of a bigger sound as students jump into the incredible adventure of harp study and playing. I wanted to create learning from the beginning that focused on true foundations of key skills we want to be able to use as musicians; playing from the score, playing by ear and learning to improvise, all from the very first moment a student sits at the harp. All with a very strong foundation in harp technique, to really enable students achieve their hopes and dreams with their playing. In 2016 I launched my first online START HARP course and took the first steps in making this a reality. 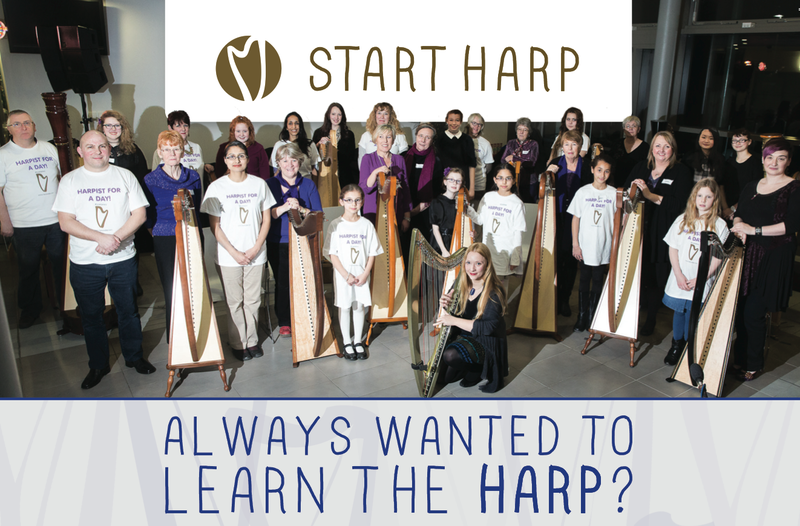 START HARP has gone on to teach harpists from all round the globe, including Wales, UK, mainland Europe, Canada, America, New Zealand, Australia and Tasmania! Now, as I sit here writing this, I have completed filming of my online harp school START HARP! There are three courses totaling 36 weeks of tuition taking students from never playing the harp to around grade 4 level. I think it has taken me over 1,000 hours to create (not counting all the thinking time in the middle of the night of course!). Oh, did I mention I fell pregnant as soon as I started recording the classes?! So I now have the online school START HARP and the most INCREDIBLE daughter I could ever have imagined, I am totally blessed. As I look back I see that the last two years has really seen some epic creation in my life! Thank you so much to all the BETA testers, thank you all the proof readers, those who have had their ears bent while I talked through ideas, thank you all who have inspired me as a harpist and harp teacher, thank you Deborah Henson-Conant for your mentorship, thank you to my husband and mother for EVERYTHING! So, what am I going to do in 2018? I started by sharing the completed version of START HARP with the world by launching FOR THE FIRST TIME EVER, all three completed courses, LEVEL 1, 2 and 3 at the same time in January. The next session of all three courses will begin on the 22nd April 2018. Shelley Fairplay’s next sessions of START HARP begin 22 April 2018. Registration is now open! There is an early bird discount available if you book on or before 15 April 2018.